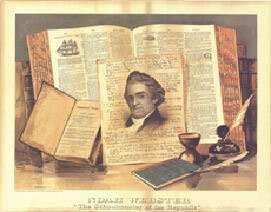 Religion was an important aspect of Noah Webster’s life. As a boy, he attended church with his family and learned to read from the King James Bible. His father was a deacon in the local Congregational church, the highest lay position. As he aged and raised his own family, Noah’s faith grew even stronger. He led his wife and children in daily prayers, using a prayer book he wrote. In April 1808, Noah Webster’s two oldest daughters, Emily (17) and Julia (15), attended a revival meeting where they felt “God’s touch.” They convinced their father and mother to join them at another meeting where they too felt changed. The experience, referred to as conversion, was comparable to the experience of being “born again” as a Christian today. 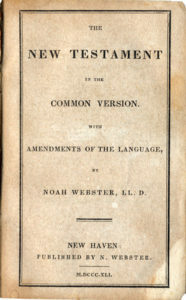 In 1832, Webster took on what he called “the most important enterprise of my life” – transcribing the 1611 King James Bible into language more understandable to American readers of his day. 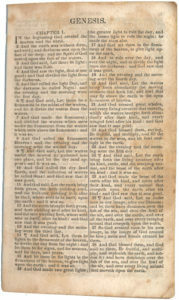 His changes were minor ones – for example, replacing out-of-date terms such as “kine” with “cows,” and replacing more vulgar words with more refined versions.Despite Webster’s careful attention to detail and humble desire to more clearly “present to the readers the Word of God,” his Bible was not well received. It is now one of the rarest American Bibles ever produced.